The last step in the field of motion pictures productions for the digital cinema is the creation of the DCP (Digital Cinema Package). 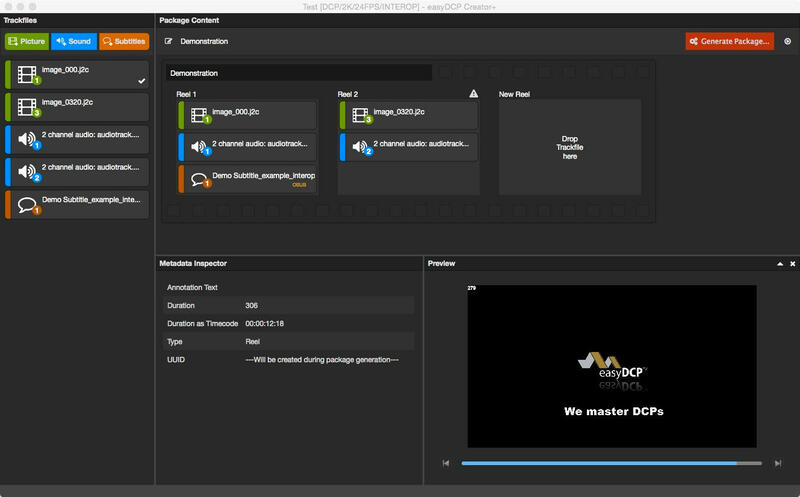 The easyDCP Creator software offers a easy-to-handle solution for DCP creation. easyDCP Creator was especially designed for small and medium-sized production companies and post-houses and runs on a PC or MAC. With only a few clicks a complete SMPTE- or Interop compliant DCP for distribution to digital cinema screens can be generated. For a first experience with this software and the DCP creation we offer a free download of a special trial version of easyDCP Creator. The unlimited and full functional trial version burns in a visual watermark into the DCP.